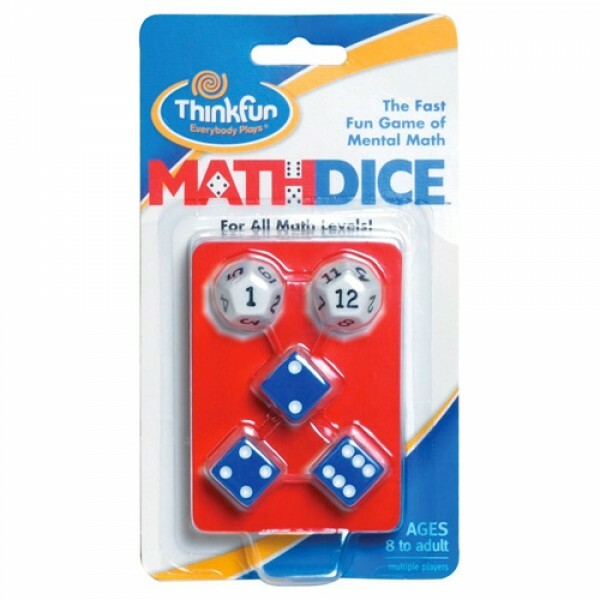 The MathDice program is an exciting new way to help kids from 3rd through 7th grade with their math education. The basic game has all the attributes that naturally work for kids - its simple to learn, easy to understand, highly tactile and manipulative, it's competitive, skill based but with an element of chance, you get better as your skills improve, and it's fun. To play, you generate a "Target Number" (by rolling dice) and three "Scoring Numbers" (by rolling three more dice). The goal is to form a math equation out of your three Scoring Numbers that gets as close to the target as possible. If you're playing competitively, the player with the closest score wins a point. If you're playing cooperatively, you work with your teammates to find an equation that gets you closest to the target number. Includes 12-sided die, five 6-sided dice and scoring track, instructions, and game-go bag.